"The first time they brought me to that room, just before they (the C.I.A.) started talking to me about this plane", tells U-2 pilot Bob Erikson, "they turned on the tap in the bathroom and the volume of the radio very loud, in case some spy might be hanging around." That is how you perceive the atmosphere of secrecy surrounding this plane. Right from the end of World War Two, a heavy tension grew among the Allies. Little by little, from Berlin blockade to Korea war, the upsetting atmosphere of Cold War developed, and both Americans and Soviets came to suspect each other of attempting mutual annihilation. In 1954, when a Myasischev M-4 strategic bomber popped up above the traditional May 1st celebrations, which were a shop-window for the Soviet military force, the American political and military establishment got scared. Since 1952, Dwight "Ike" Eisenhower was the President of the USA. Staline died two months after his nomination, which gave "Ike" good hope to open a policy of dialogue with Moscow. As he intended to put an end to the Cold War, he had to confront with a violently anticommunist Republican opposition and the military who demanded more resources. CIA diarist Donald Welzenbach explains: "The US Air Force claimed that the Soviets were manufacturing many more bombers that we were and demanded more funds to massively increase their own bomber fleet." It is in this atmosphere of quasi-paranoia that one of the most secret programmes in the history of aviation, the Lockheed U-2 "spy-plane", was developed. That way, instead of conducting the American politics according to hearsay, "Ike" would have reliable intelligence at his disposal. On July 4th, 1956, U-2 pilot Hervey Stockman flew over Minsk on the occasion of an initial assignment over USSR. After having been identified by some Soviet radar, he was chased and attacked by MiG fighters unable to fly above a 50,000-ft ceiling, and they could not reach for him. That was followed by a long series of observation flights that led the U-2 spy-planes to fly regularly over Soviet Union. Dino Brugioni, an expert from the CIA in the interpretation of air photographs, says: " After a few months, we could affirm that the threat of bombardment did not exist. We had eradicated President Eisenhower's main source of concern. This enabled Eisenhower, for at least some time, to get rid of his war-crazed opponents and to some extent nurture some kind of dialogue with Nikita Khruschtschev, with whom he was building up a bilateral disarmament and atmospheric nuclear test termination process. The "bleeps" broadcast by Sputnik 1 on October 4th 1957 shook the Pentagon like a thunderstorm. 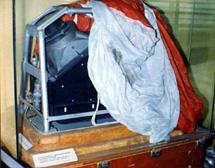 If the Soviet were able to put a small radio transmitter on orbit, so they could fire nuclear missiles over the USA! Therefore, "Ike" reluctantly authorized further flights over USSR, as he averred later: "I would have considered such a violation of our air space by the Soviets as an act of war." Under CIA pressure, as they needed information about a Soviet missile base, "Ike" authorized an ultimate assignment over Soviet territory, the longest "overflight" ever. 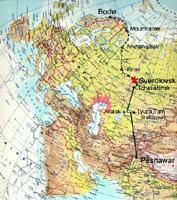 On May, 1st 1960, Gary Powers, the most experienced U-2 pilot, took off from Peshawar base in Pakistan, to Bodø in Norway: a 3,800 mile flight, of which 2,900 mile over Soviet ground. At first the flight unfolded normally, with a huge number of photographs being taken, but as he was turning over Sverdlovsk, Powers noticed a trail of condensation following the same course as his: a fighter was trying to intercept him, but he was far too low anyway to constitute a real threat. Suddenly, there was a terrible noise at the rear, and the airplane entered into an inverted spin, with its nose up. Instead of using his ejector seat, Powers waited until he reached the 33,000 ft level to drop his canopy and jumped out at 15,000 ft. only because of oxygen connection problems. His parachute unfolded normally and he was captured right from the moment he touched ground. While swirling down, he noticed another parachute : it was the pilot of the MiG-21 who was following him. The AA battery crew had boozed heavily to celebrate the First of May and they had fired a full salvo of SAM ground-air missiles, after receiving the order to shoot down the U-2. The destruction of the U-2 had been followed by the American radar network, "Ike" had been informed and a few days only prior to the Paris summit, he could see his worst fears come true. The Americans reported the loss of a meteorological airplane, which was heading for Turkey. However, it should be noticed that the U-2 was not registered as a US Air Force machine but as a civilian plane. On May, 5th., Khruschtschev announced that a U-2 had been shot by the Soviet anti-aircraft defence. The American thought they could allege that one of their weather reconnaissance airplanes had infringed over Russian border unexpectedly, assuming that both the plane and the pilot had been lost without any remnants . That was the time when the Soviets triggered their psychological bomb: they revealed Power's capture. It was therefore more difficult to conceal the genuine purpose of the assignment of the plane because movie cameras had been recovered from the wreckage. 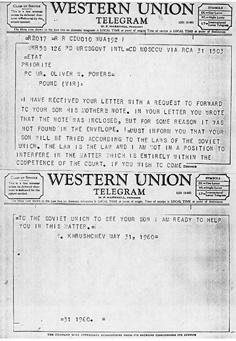 Khruschtschev was infuriated while he disclosed the news, accusing the Americans to sabotage the Paris summit meeting, demanding that "overflights" be terminated and public apologies from President Eisenhower. In spite of the huge turmoil around, there was no way Ike could comply without being dishonoured. Needless to say, the summit meeting in Paris was a total failure. Gary Powers was brought before a Soviet Court under a charge of espionage and got a ten year "freedom deprivation" sentence. In fact, seventeen months later, he was exchanged for a Soviet spy arrested in New York in 1957, Rudolf Abel. His repatriation back to the USA did not mean his ordeal was over as various accusations were being asserted against him there. In fact, several accounts of this event were disseminated. Both Americans and Soviets agreed to assert that the U-2 had been directly hit by SA-2 ground to air missiles at 65,000 ft. Other accounts were concocted, stating that the Soviet were just unable to manufacture such sophisticated ground-to-air missiles (which was the case anyway). In fairly embittered memoirs, Powers gave hints that he could disclose other explanations about the whole affair. His U-2 B 56-6689 had a nasty reputation for trouble. It had started developing that unpleasant feature in September 1956 when its pilot was forced to an emergency landing on Fusigawa (Japan) air base that had led it into a 7 ft.-deep pool of mud. It should be noted that the sight of an entirely black-painted plane, without any identification mark, thus infringing international legislation, could not fail to upset Japanese observers. This was then the repaired plane that had been shot by a SAM missile. The interception occurred at 65,000 ft., which tends to prove that Soviet ground-to-air missiles were efficient, but the operational ceiling of the U-2 B model was 90,000 ft. The loss of the U-2 and the American denial to apologize caused such a diplomatic disaster that almost all the observers considered that it was the end of this plane, at least for non-scientific assignments. Although it seemed to be forgotten, this plane kept on flying on such assignments over some poorly-equipped countries, such as Cuba. On October, 14th, 1962, a U-2 brought back some photographs showing in San Cristobal (Cuba) the installation of offensive Soviet-made missiles. This triggered another East-West crisis, a very serious one. President Kennedy ordered a blockade on Cuba, which made tension grow between the United States and the Soviet Union, to such an extent that a Third World War was really feared. Things smoothed down when the Soviet agreed to give up their attempt and to re-embark their equipment. Was it the end of the U-2? In spite of the commissioning of its successor, the SR-71 born in 1962, the U-2 kept on flying (for some genuinely scientific purposes) over Mao's China (where another one will be shot down by the same SA-2 missile), Cuba, Korea, Vietnam… In fact, the "Lady of Shadow" even became fashionable again, when the US Air Force requested the manufacturing of 25 more of these machines in 1978. 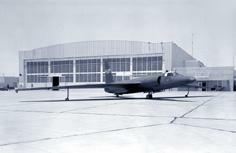 The U-2 had been improving through new versions, and the number of new machines remained undisclosed. It was just renamed TR-1 and mainly used during the Gulf War over Iraq in 1991. As for the famous soviet M-4 bombers which had caused such a turmoil and triggered the development of he U-2 programme while flying on May 1st 1954, it was in fact the same and only plane that kept flying in a loop again and again…. If it was obvious that the strategic M-4 bomber (NATO code "Bison") was able to fly over the USA with nuclear loading, on the other hand it was quite impossible to know the number of these planes. Did the Soviet have one or more than one hundred? Tass Click! 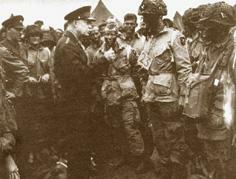 "Ike" Eisenhower in England a few days before D-Day. Commander of Allied forces in Europe during W.W.II, he was a cautious democrat, anxious to maintain peace but at the same time, he did not want to see his country losing military power. A Lockheed TR1A-U. It should be noted that this machine bears no identification at all. 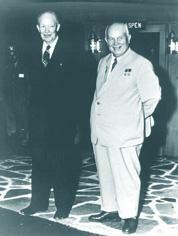 "Ike" Eisenhower and Nikita Khruschtschev : their East-West dialogue policy aimed at a bilateral reduction of armament and at the end of nuclear tests in atmosphere. At Camp David (USA) in 1959, they had contemplated pursuing their disarmament policy during their following summit meeting in Paris in 1960. Sputnik 1: this "moon-baby" created a new era in space conquest and a huge panic among the Americans.Tass Click! 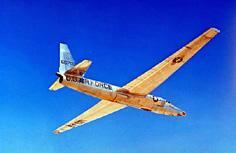 The U-2 was not developed for the USAF, but for the CIA. The talented and fantastic Kelly Johnson, Lockheed's "avant-garde" engineer developed the project in eight months: it consisted of building an aircraft capable of flying above 70,000 feet (21,350 meters) with a minimum range of 6,000 kilometers, of very light weight, but capable of carrying state of the art cameras with more than 1,600 meters of film. A U-2 displaying mysterious marks was presented to the American press (NASA 55741). The aim was to make them swallow that this plane was harmless since it was non-military and science-oriented. NASA Click! Gary Powers' mission map. Click! Washington Daily News du 7 mai 1960. 1962: a soviet cargo sailing to Cuba. Aboard, strategic missiles. The Americans, displeased by Gary Power's incident, presented their "Blackbird" as a strategic bomber. In fact, that was a spy-plane, just like the U-2.